Median connects a vertex of a triangle with mid-point of its opposite side. Point X is the mid-point of side RP. Example 2: How many medians can a triangle have ? Solution: As we know that a triangle has three vertices and three sides. And a median connects a vertex and opposite side. Therefore we can say that there can be three medians in a triangle. 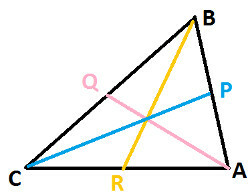 Vertices A, B & C are connected to the mid-points Q, R & P of their respective opposite side BC, AC and AB.